32.5 mm rain fell in July, and the chart shows very small traces of the usual Pb-210 and Be-7. In this chart I have CPS on the Y axis to show activity, and have turned off Y log to show linear scaling. This is only a test chart of the polyester part of the rain water filter system design. The good news is that local background levels here have stabilized, and there haven’t been any significant upticks, or events to report. July 2015 monthly average background radiation level was 5% above the pre-Fukushima average. July average for 2014 was 5% above the pre-Fukushima average. July average for 2013 was 5% above the pre-Fukushima average. July average for 2012 was 9% above the pre-Fukushima average. 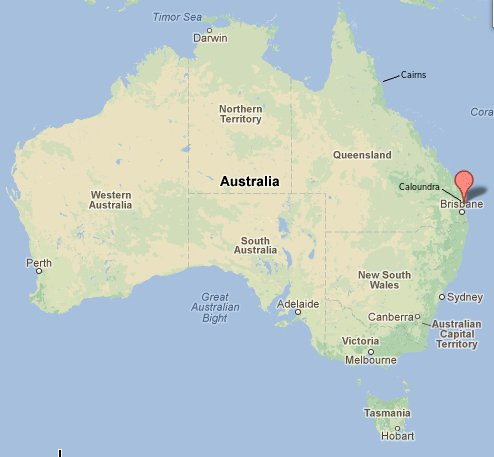 Caloundra and Cairns July day average background comparison chart – Cairns is on the east coast of Australia, and it is much closer to the equator than Caloundra, see location map. In the background comparison chart, Cairns is red and Caloundra yellow. On this page you will find all the month and year average charts, for local background radiation levels from November 2007 to 2015. Southern Hemisphere June 2015 Rain Water Test Report. 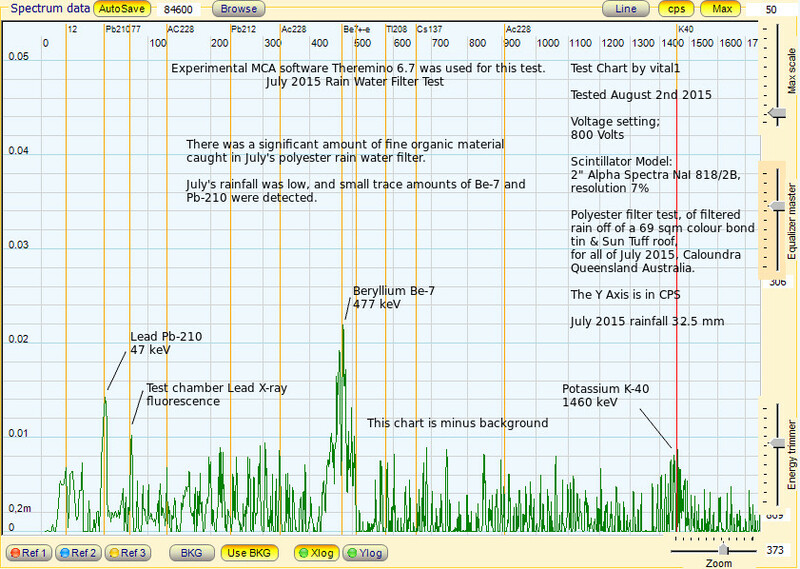 There was a lot of very fine organic material captured in the down pipe rain water filter in June. There was also a lot less Lead Pb-210 than Beryllium Be-7 in June’s rainwater filter test. In summer we tend to see much more Pb-210 detected in the rain water tests here, when the air masses tend to come from a northerly direction. There was also a possible trace detection of Cesium-137. 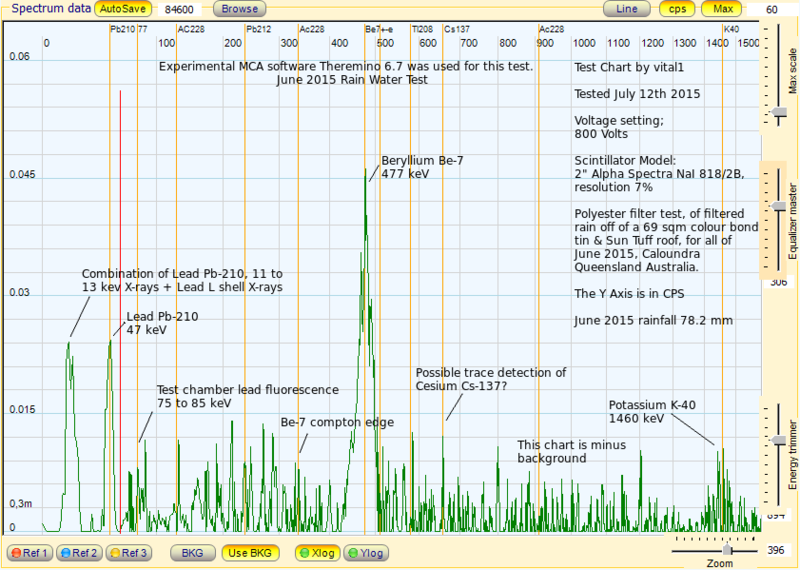 It was a very small detection, less than one Cesium-137 gamma ray detection every ~100 seconds. There was no corresponding Cesium-137 32 X-ray detection to help confirm that it was Cesium-137. At these low detection levels, the amount of low energy 32 keV Cesium-137 X-ray present, may be too small to be detected, so there is a degree of uncertainty to it being a definitive Cesium-137 detection. Rainfall for June was 78.2 mm. Less Pb-210 in the filter means less Radon-222 was in the air. This was also reflected in the local live Radon monitor. Years of rain water tests can be found here. Southern Hemisphere Background Radiation Report For June 2015. June 2015 saw a decrease in month average background levels compared to the last couple of years. June saw more Southern Ocean air reach this location, hence the lower background level. A number of significant solar radiation storms occurred in June. No significant increases in local background radiation levels were detected during these solar storm events. June 2015 monthly average background radiation level was 3% above the pre-Fukushima average. June average for 2014 was 7% above the pre-Fukushima average. June average for 2013 was 7% above the pre-Fukushima average. June average for 2012 was 3% above the pre-Fukushima average. Cairns is on the east coast of Australia, and it is much closer to the equator than Caloundra. It is much more likely to get Northern air flows during the cooler months than Caloundra, see location map. In this chart, Cairns is red and Caloundra yellow. On this page you will find all the month and year average charts, for local background radiation levels from November 2007 to 2015. 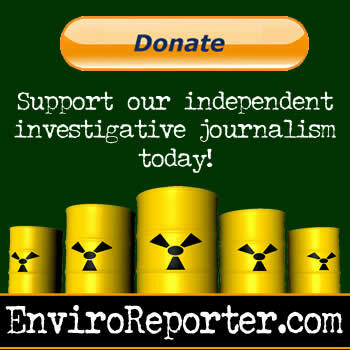 The most recent data suggests the amount of airborne contamination reaching this location has decreased significantly.